Marked 1203. Or PCB Mount solder through hole to PCB. 3A 250VAC 6A 120VAC. Slide switch has 3 positions On left – Off centre – On right (both poles). 2 Pole On/Off On. C & K Slide Switch Part no. 1203-M1-S4-C-M-I-2. 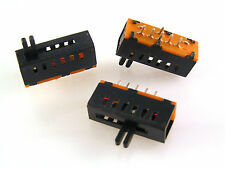 DP3T PCB mount 8-pin 3 Positions Slide switches. Qty: 15pcs. MFG: LSC Part# 2.5T23P12G5. 10 Pieces - Slide switch on-off-on. New by Omron. 100mA. 30vdc. C8ga-a13. Add to Your Listings. MFG: LSC Part# 3T22P12G5. 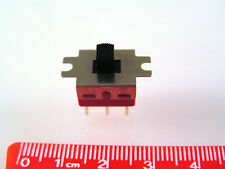 DPDT PCB mount 6-pin 2 PositionsSlide switches. Qty: 15pcs. Insulation: 500MOhms " 500VDC. New by PIC. Wk-15h01. Quality switch made in USA. YOU ARE BUYING A NEW 6 PIN SLIDE SWITCH. 0.5A 125V DC. Salecom type ESP-10-10-H-Z03. During that process you will be issued with an RMA number. DP3T (2P3T) 8 PINS - PC MOUNT. NEW YSC MICRO MINI SLIDE SWITCH. Marks: YSC. 3 Position Slide Switch. 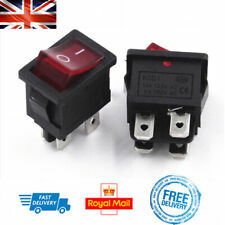 80 PCS - NEW SWITCHES. LOT of 80 SWITCHES. 12.7 mm (0.5") L x 7.0 mm (0.275") W x 4.75 mm (0.19") H.
A right-angle mounting SPDT slide switch with PCB pins on a 2.54mm pitch. Ultra-miniature slide switch. • DIL 8 WAY NEW. 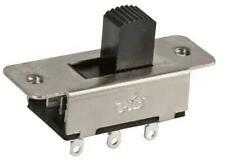 • SDS-8-014 ERG SWITCH. SWITCHING LIFE: 10,000 cycles (15-18 cycles/min. ).